Poll: What’s Your Favorite Twitter App for webOS? Do you tweet, follow and enjoy the chirp of Twittering on your webOS device? If so, take part in our poll and let us know what Twitter app should reign supreme. Feel free to offer up your comments if you’d like elaborate on why you feel your selection is the best of the bunch. Is it Tweed, Twee, Spaz or Bad Kitty? 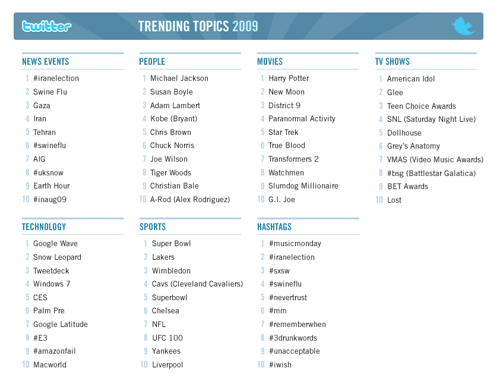 Twitter announced the top trending terms for 2009, broken out by category. In the technology area, the Palm Pre was #6. Even more impressive, the Palm Pre was the only consumer electronics product in the group. Others included Snow Leopard, Google Wave, Windows 7 and other software products. Clearly, the buzz from CES 2009 helped to propel the Palm Pre to the tops in technology. Palm as a company has had a presence on Twitter, allowing customers to interact with the company, a move that certainly had a positive impact on their relationship with customers. Do you have questions about Palm’s upcoming Pixi? If so, head on over to Twitter today. Starting at 11:30 PST, Phil McClendon, Director of Product Marketing for Palm, will be fielding questions. To ask a question, tweet your question to @palm. You can follow all the questions and answers by searching the hash tag #pixi. You can also check out our Palm Pixi preview and look for our comprehensive review of the Palm Pixi in the coming weeks. Time for another round of App Catalog Additions, tracking new applications that enter the official Palm App Catalog. Tweed $1.99 : New paid version offers direct photo upload, full screen profile pics, new notifications dashboard. There is also a lite version which is likely similar to your existing app if you are using Tweed. Yell.com Free : Yell.com lets people find local businesses and service prividers from Yell’s comprehensive UK Yellow Pages listings. 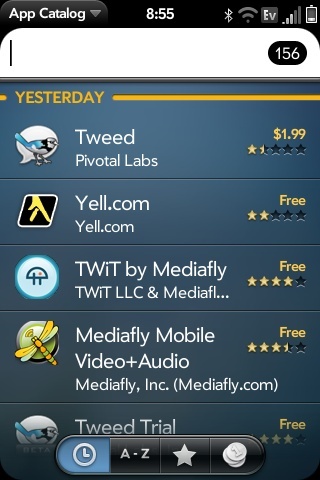 TWiT by Mediafly Free: Mediafly Mobile featuring TWiT.tv allows you to access the entire TWiT Netcast Network all of the audio shows and the new video shows. Mediafly Mobile Video + Audio Free: Mediafly Mobile for the Palm webOS allows you to access the best of the web’s audio and video netcases and podcasts directly from the Palm Pre. Clearly, the big news today is the release of the paid version of Tweed. The pricing is introductory, so those looking to upgrade to the paid version should do so early. Download any of the new apps? Have a favorite? Let us know in the comments or in our Palm Forums. The selection of Twitter apps is sure to grow when Palm’s App Catalog introduces paid apps and a promising app on the horizon is Bad Kitty. The app is still under development, but looks very promising. Forget about the awesome name and app icon, Bad Kitty offers an interesting UI (user interface) and design. Check out the video of Bad Kitty running in the Pre emulator and let us know what you think. 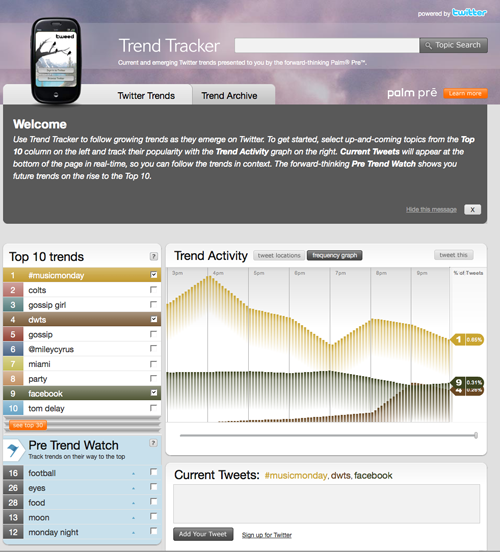 Palm has partnered with Federated Media on a new Twitter trends tracker. The site features the top 10 Twitter trends and shows related tweets as they happen. The site is heavily sponsored by Palm, showcasing the Pre running Tweed, one of the Twitter apps available in the Palm App Catalog. The “Pre Trend Watch” builds on Palm’s thinking ahead mantra and displays future trends that are on their way up. You can find the site at http://wwww.palmtrendtracker.com. It’s an interesting marketing effort and the site will garner usage from potential Palm customers. Check it out and let us know what you think in the comments or in our Palm Pre and Pixi forums. @palm when can we expect your App Catalog to offer a wide variety and steady stream of apps.